The Philadelphia Flyers have reached an agreement on an eight-year contract extension with center Claude Giroux that will take effect at the start of the 2014-15 season, according to general manager Paul Holmgren. 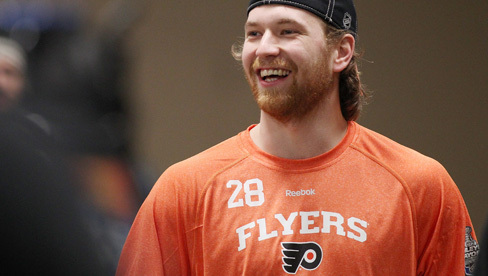 Giroux, 25 (1/12/1988), was named the 19th captain of the Flyers on January 15, 2013. The 5-11, 172-lb native of Hearst, Ontario is entering his sixth season with the Flyers. He is coming off a 2012-13 campaign where he posted 13 goals and 34 assists for 47 points while appearing in all 48 games. In the 2011-12 season, Giroux enjoyed a breakout campaign as he led the Flyers to the second round of the Stanley Cup Playoffs. He posted some of the best offensive numbers for a Flyers player in a dozen years, finishing the regular season with 28 goals and 65 assists for 93 points on the season, all career highs. The 93 points were the most by a Flyer in a single season since Eric Lindros had 93 points in 1998-99, and the 65 assists were the most by a Flyer since Lindros posted 68 in 1995-96. Giroux also became just the fourth Flyer ever to record 50 or more assists in consecutive seasons, joining Bobby Clarke (8 seasons, 1972-1980), Brian Propp (3 seasons, 1983-86) and Mark Recchi (2 seasons twice). Giroux ranked third in the NHL in scoring and led the league in power play points with 38 (6G, 32A). Giroux went on to have a record-setting performance during the first round of the 2012 Stanley Cup Playoffs vs. Pittsburgh. He scored 14 points in the six-game series, leading all NHL players. He became just the second player in Flyers history to score 14 or more points in a playoff series, trailing only Tim Kerr’s 15 points (10G, 5A) in the 1989 Division Finals vs. Pittsburgh. He also set a Flyers franchise record for points in a playoff game with his six-point night in Game 2. The previous record was five, shared by Reggie Leach, Bob Dailey and Mark Recchi. Giroux appeared in 42 games as a rookie in 2008-09, recording nine goals and 18 assists for 27 points. He scored his first career NHL goal on January 27, 2009 at Florida. He went on to appear in all 82 games in each of his first two full NHL seasons in 2009-10 and 2010-11. During the Flyers’ run to the 2010 Stanley Cup Final, Giroux recorded 10 goals and 11 assists for 21 points in 23 games, including the game-winning goal in overtime of Game 3 of the Final against Chicago. Giroux has posted a total of 91 goals and 199 assists for 290 points in 333 career games, while adding 21 goals and 34 assists for 55 points in 50 playoff games. He was selected by the Flyers in the first round (22nd overall) of the 2006 NHL Entry Draft.